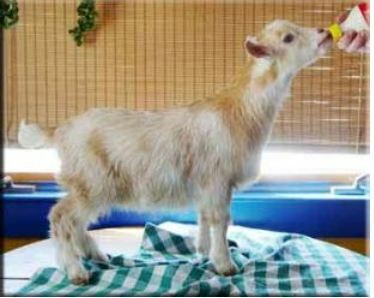 Colostrum is the first milk produced by a goat after she freshens, and it’s the first milk that the goat newborn kids must drink within the first few hours. It’s a thick, sticky, yellow milk that contains high levels of fat, protein, vitamins, and antibodies that newborn mammals must ingest within a few hours after birth. This is how the dam passes immunity (specific to her location and environment) to her kids, and the faster they get colostrum, the faster they’re protected until they can produce antibodies against infection themselves. Newborn goat kids need colostrum quickly because a newborn’s intestinal tract is not completely developed and the antibodies can be absorbed whole in their disease-fighting form. After 12-24 hours, the antibodies and proteins in colostrum are broken down in the kids’ intestinal tract and then absorbed. This destroys their disease-fighting ability, although they still provide nutrition. 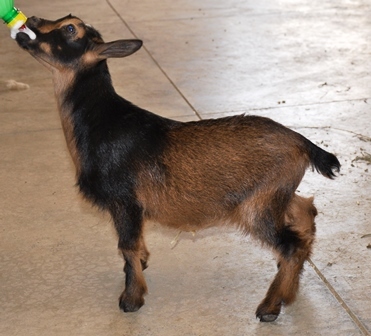 A goat kid should receive at least 1 ounce of colostrum per pound of body weight, three times daily in the first 24 hours of life. If the kids are nursing from the dam, it’s not possible to measure exactly how much is being ingested but the dams usually regulate how much the kids get. Just make sure that the kids really are drinking. When the kids are being bottle-fed, the exact volume is known. If bottle-feeding, it’s better to feed frequent smaller amounts rather than one or two big amounts (the dams usually make sure that any kids nursing are getting frequent small meals). Ensuring that the kids get colostrum right away gets them started on the right track. It’s so important, that buying a doe and bringing her to your farm shortly before kidding is not recommended. That’s because she has no chance to build up antibodies specific to your farm and pass them on to the kids, and there’s a much higher percentage of sick kids. It’s also highly recommended that some colostrum from the does be “banked” or frozen each year (see Colostrum Banking), just in case a doe has issues and there’s no colostrum for the kids. There are commercial colostrum replacers, but it’s far better to have colostrum available from a doe that’s lived on your farm, even if it’s not the kid’s dam. « 2019 Baby Nigerian Dwarf Goats Arriving on Bramblestone Farm!